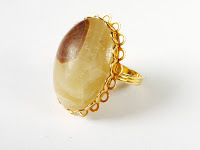 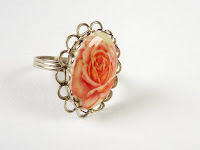 On this page are handmade rings assembled by me, all of them are adjustable. 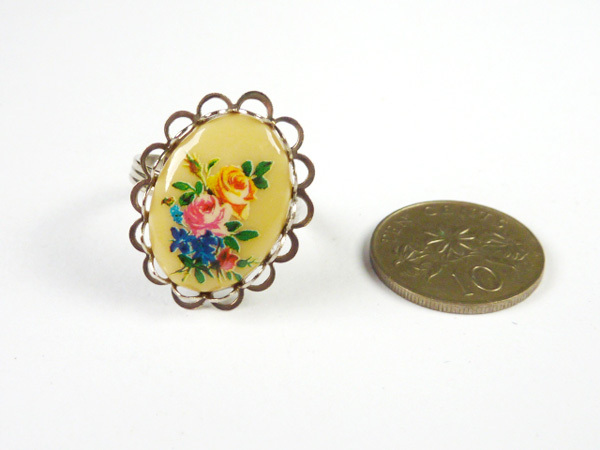 The vintage ring bases (scalloped) are uncirculated stock though they may have slight aging. They are made in the USA from about late 1960s- early 1970s. Size can be made smaller or larger; please exercise care as these are over 30 years old, without adjusting they are about US size 6-7. 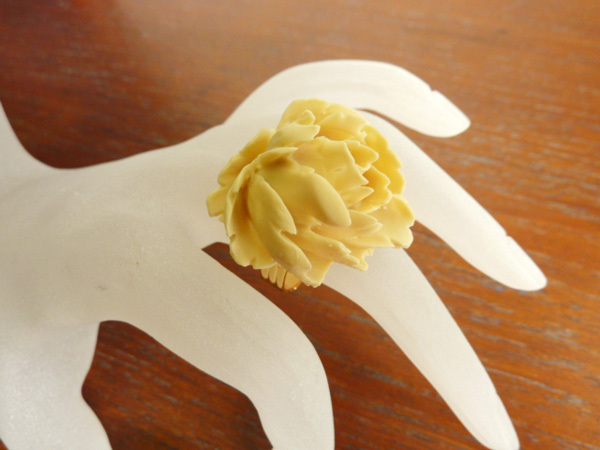 Due to the shanks being malleable I will not be accepting exchanges or refunds for them once they are worn, thanks! 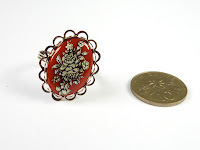 Ships in a box for protection. 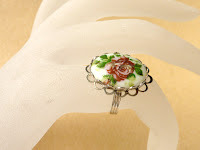 Please leave a comment to order, click thumbnails for a larger image. 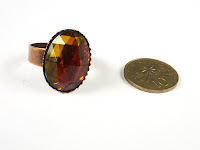 View Ring Size Chart. 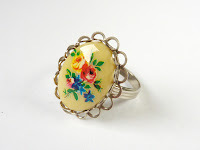 ** Some of these designs can be remade. 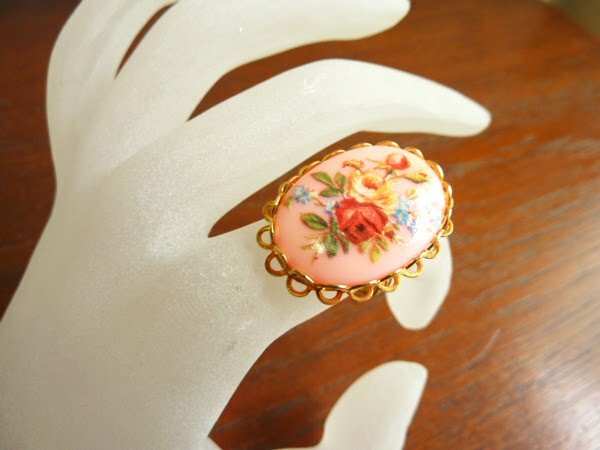 If it is out of stock, check back again in a week or two or email me for a pre-order, new stocks may be added depending on availability. 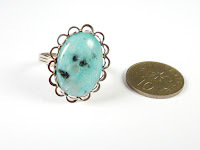 The rings stated '1 piece only' are single cabochons that I do not have multiples of. 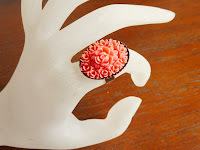 Vintage Japanese plastic rosette clusters in coral-pink. 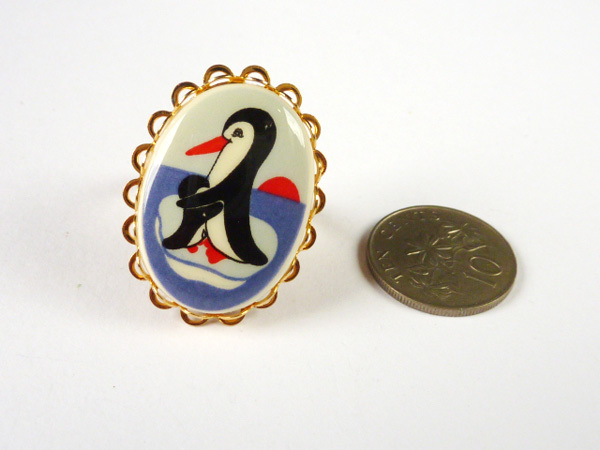 They are from the late 1940s-early 1950s, probably celluloid. This has a lot of dimension. 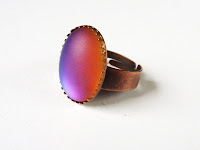 It is set on a new oxidised-copper over brass adjustable ring. 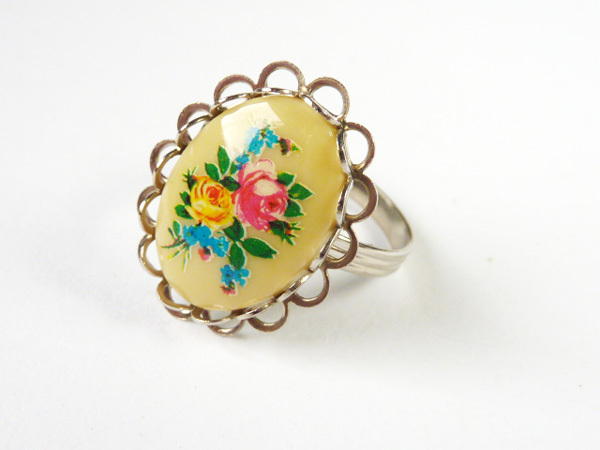 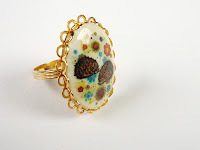 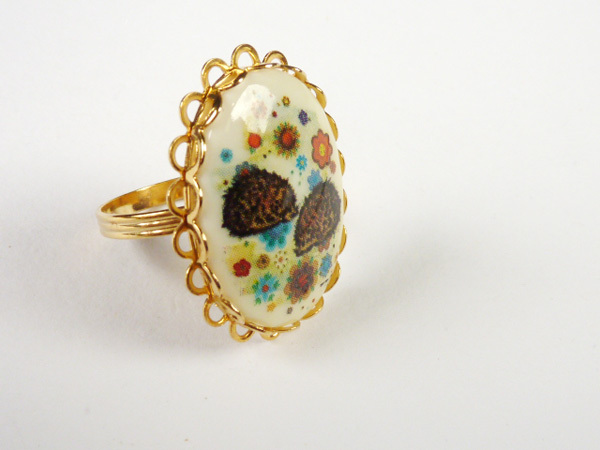 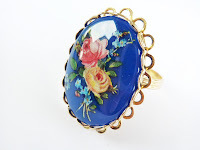 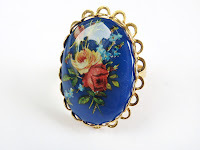 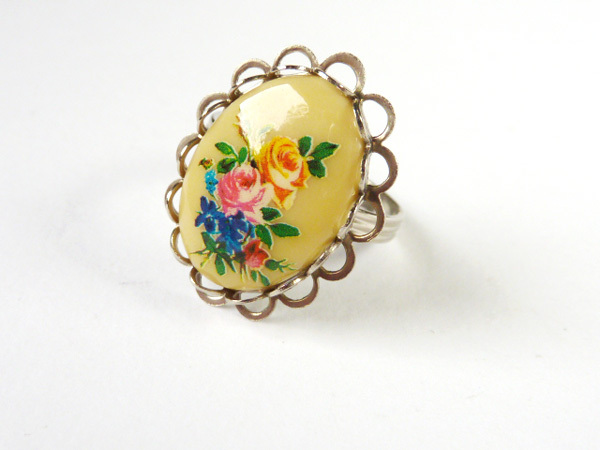 Vintage gold-plated scalloped ring with a vintage West Germany acrylic cabochon. It features a floral bouquet decal on top of a candy pink base. 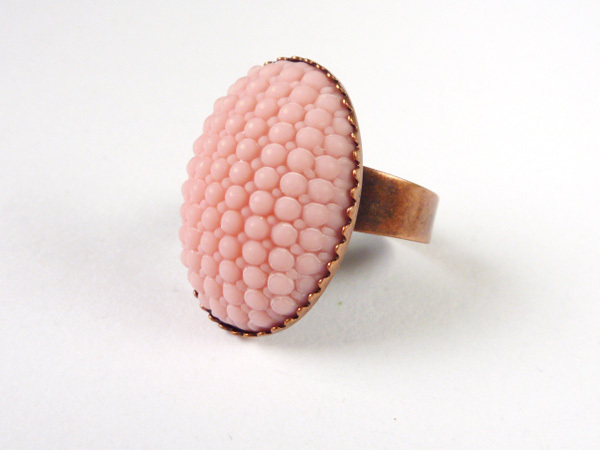 The pink is more of a salmon pink in person. 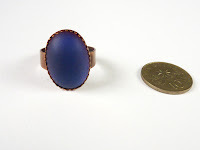 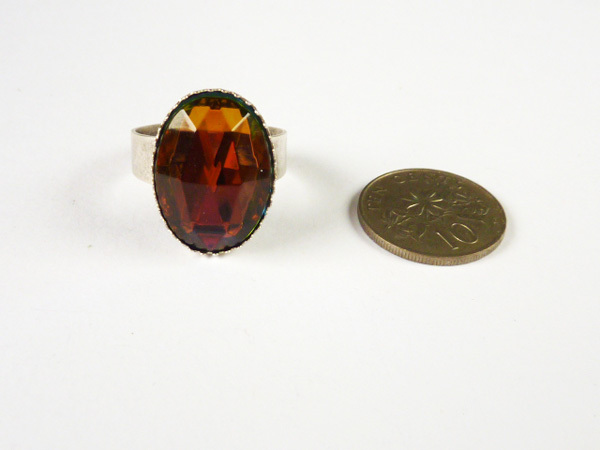 1960s- early 1970s cabochon. 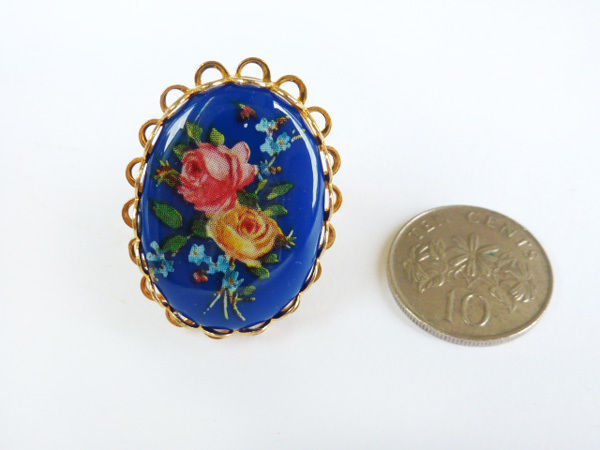 Vintage West Germany dark blue acrylic cabochon with a floral bouquet decal. 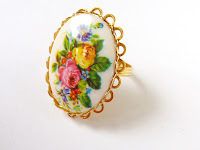 It is set on a vintage adjustable scalloped gold-plated ring. 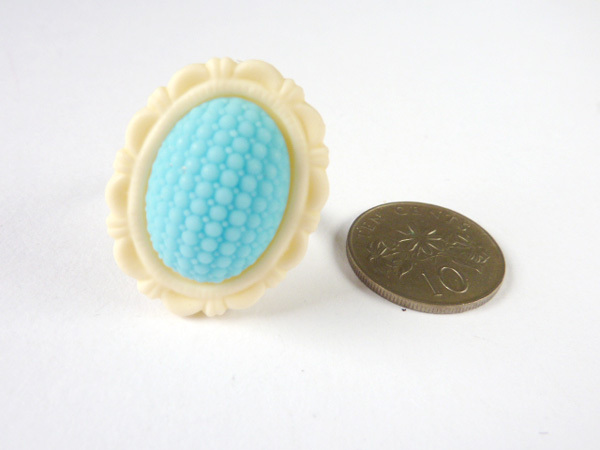 A vintage blue glass cabochon with cool bumpy textures on a molded cream-coloured resin base. 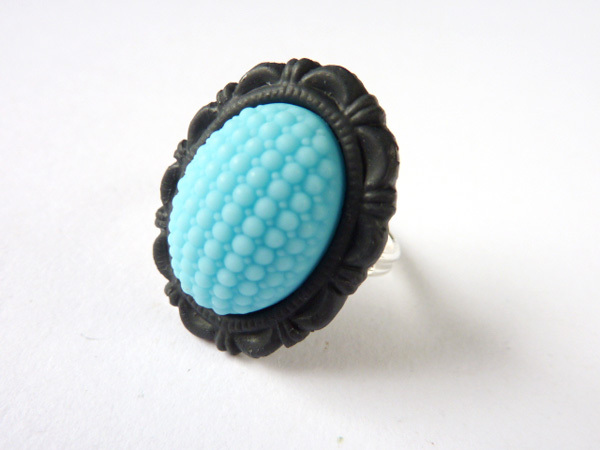 It is matte, cute! 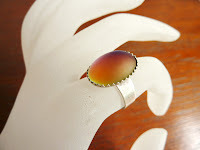 Comes on a silverplated adjustable ring, default size is size 6. A vintage blue glass cabochon with cool bumpy textures on a molded black (it actually is more very dark grey) resin frame. 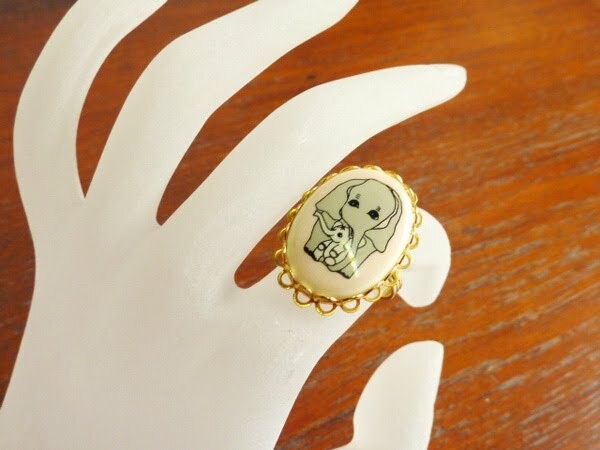 It is matte, cute! 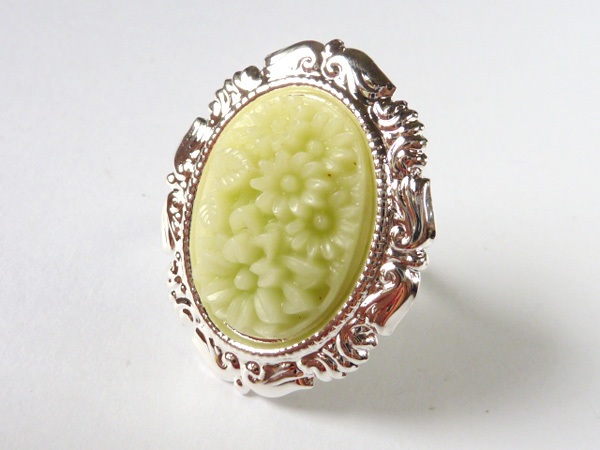 Comes on a silverplated adjustable ring, default size is size 6. Vintage matte glass in powder pink with fun dotted textures. 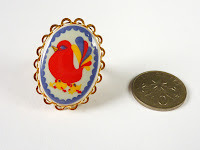 They are quite unique and a nice quality, they are probably from the 60s. Set on a new oxidised-copper over brass adjustable ring. 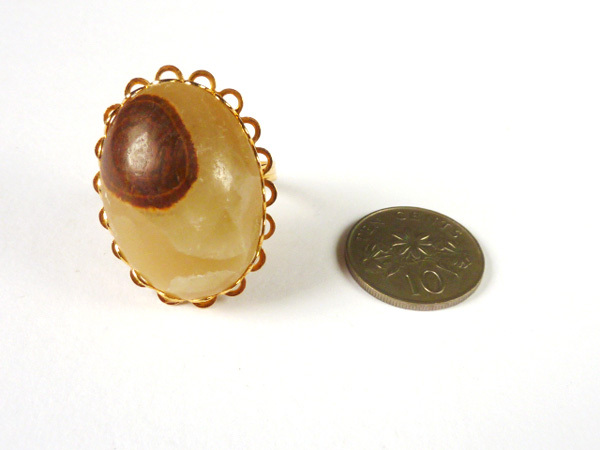 Vintage inverse-carved lucite teardrop shape set on a new gold-plated ring base, it is adjustable, the default ring size is about size 6. 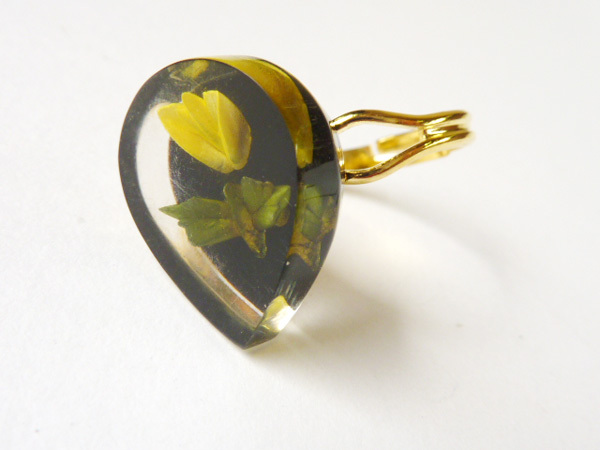 The lucite has a yellow flower design that seems to float within the plastic. 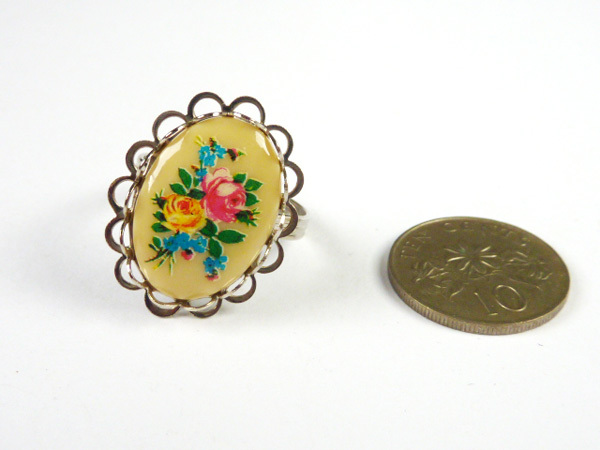 There are some scratches on the surface as these are old, about 1950s. 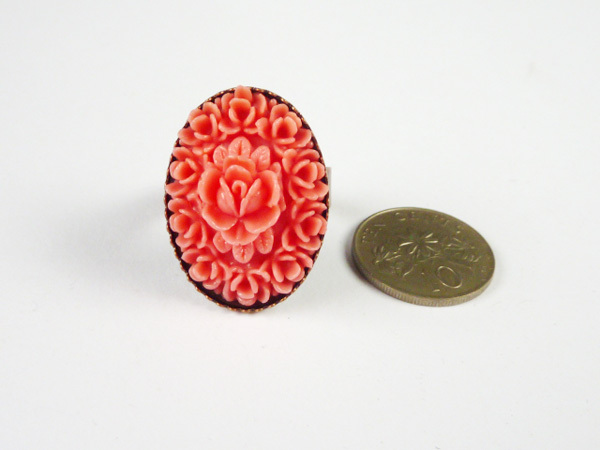 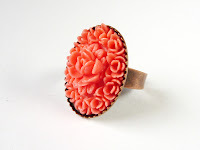 The ring you are receiving may vary slightly from the photos above as the flowers are hand carved. 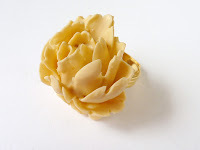 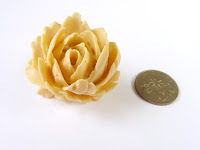 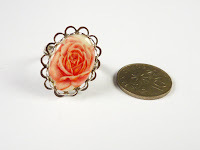 Chunky intricate resin flower in beige, it has a 19mm height, lots of relief. 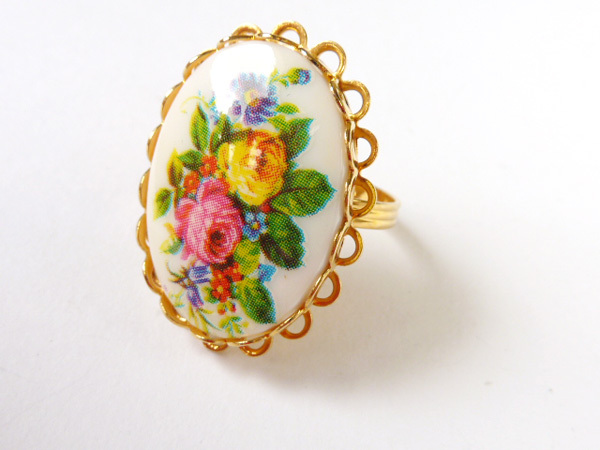 It is set on a gold-plated ring that is adjustable. 1 piece available only. Vintage 1970s West Germany acrylic cabochon with a pretty yellow flower decal on top of a pearly frosted base, there is minor aging on it where there may be slight crazing on the decal. 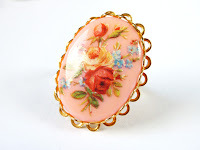 It is set on a vintage adjustable scalloped gold-plated ring. 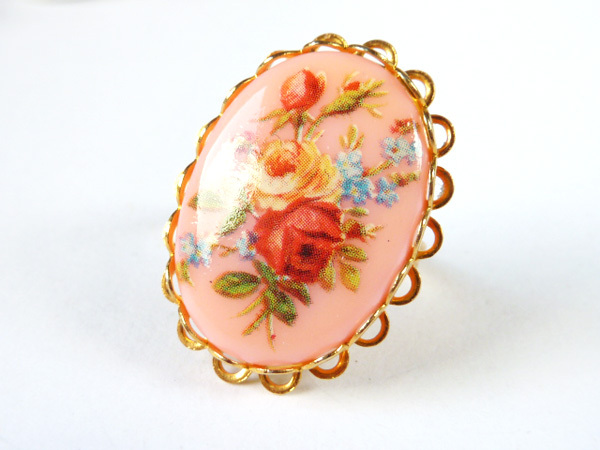 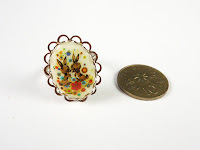 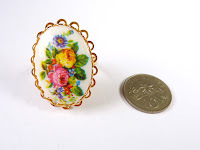 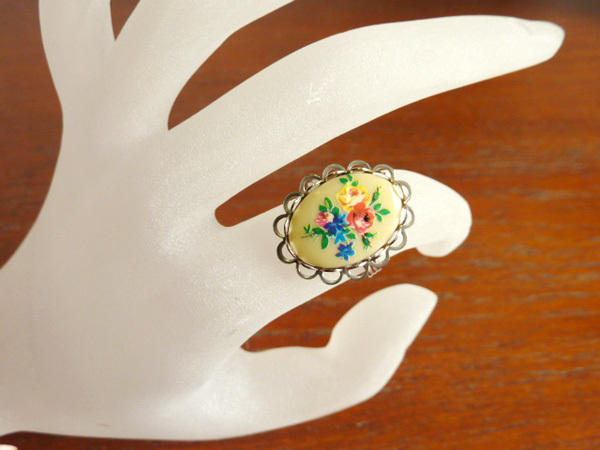 Vintage 1970s West Germany acrylic cabochon with a colourful floral bouquet. It is set on a vintage adjustable scalloped gold-plated ring. 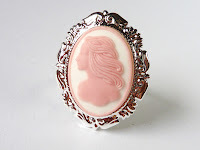 Vintage resin cameo of a lady in candy-pink with flowing hair in the wind. 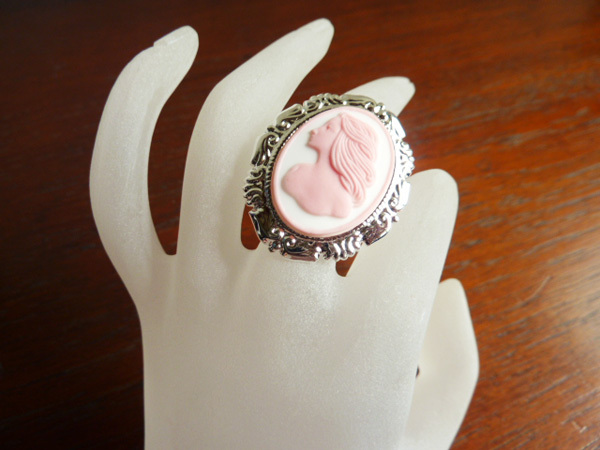 It has a pink border. 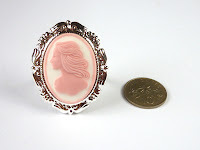 The cameo is well-made with clear details, very well preserved with no aging, simple but pretty, probably from the 50s-60s. 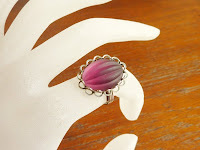 The shank is silver-plated, sturdy and nice quality. It is adjustable but since the shank is thick it may be tricky to adjust smaller, The default ring size ranges from size 9 to 10.5. 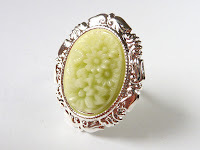 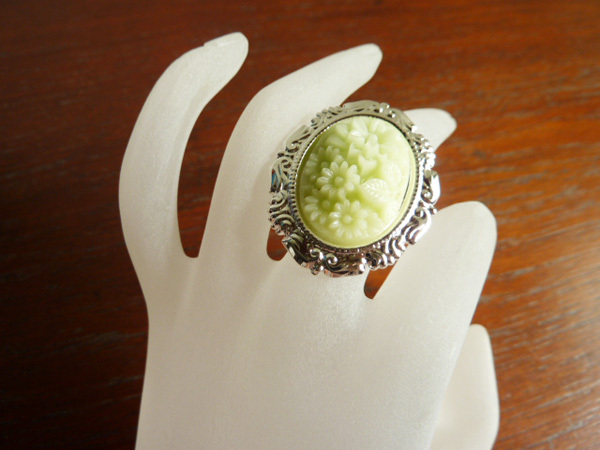 Vintage molded Japanese floral cabochon in icy-mint colour, nicely made with well defined features. 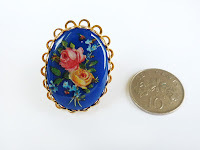 Note that the oval shapes differ slightly for each cabochon, so the photos above are representations of what you will be receiving. 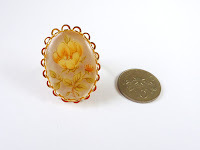 They look like glass but are plastic, probably resin. 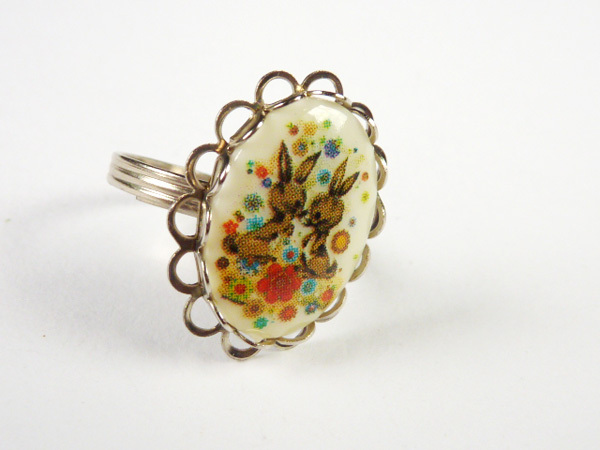 Please note the floral cabochons may have a speck of dust or two, this is a common occurrence. 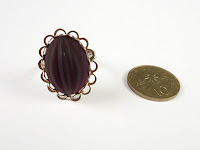 They are pretty old, possibly from the 1920s-1940s. 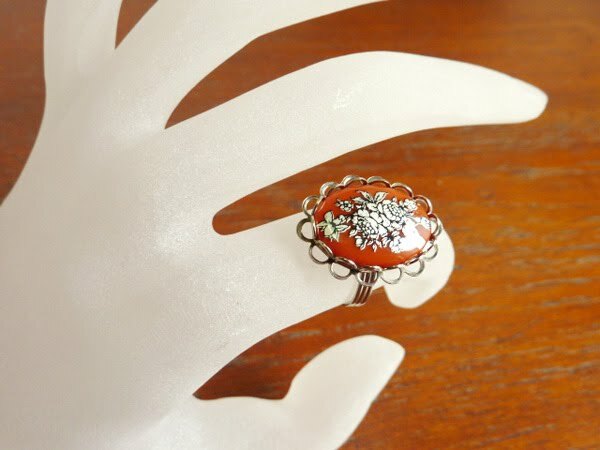 The shank is silver-plated, sturdy and nice quality. It is adjustable but since the shank is thick it may be tricky to adjust smaller, The default ring size ranges from size 9 to 10.5. 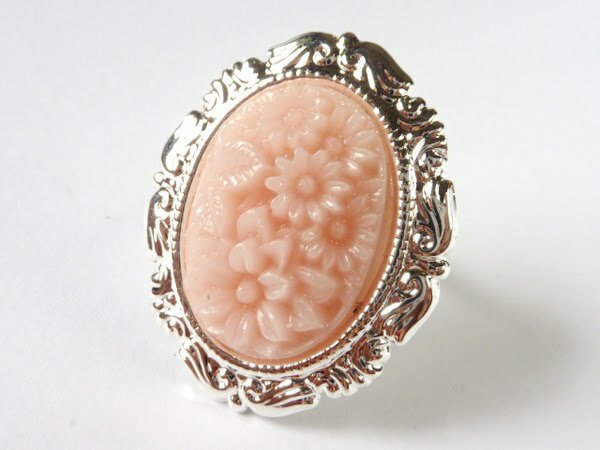 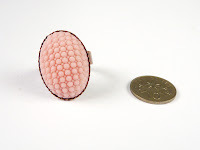 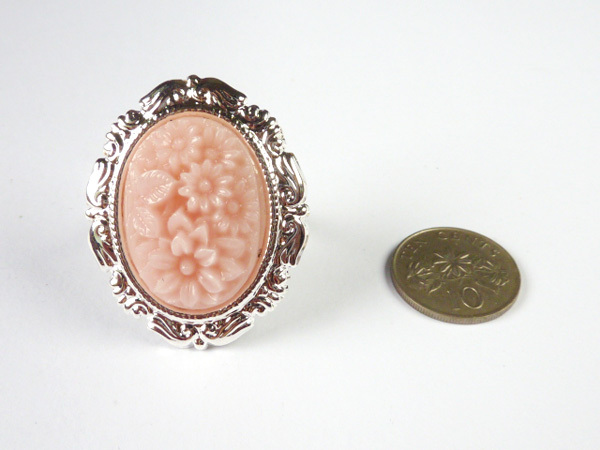 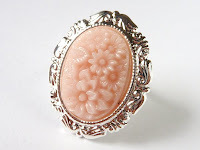 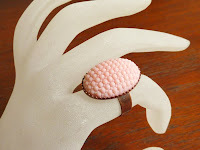 Vintage molded Japanese floral cabochon in pale pink colour, nicely made with well defined features. Note that the oval shapes differ slightly for each cabochon, so the photos above are representations of what you will be receiving. 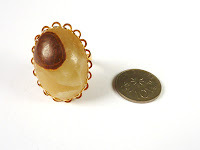 They look like glass but are plastic, probably resin. 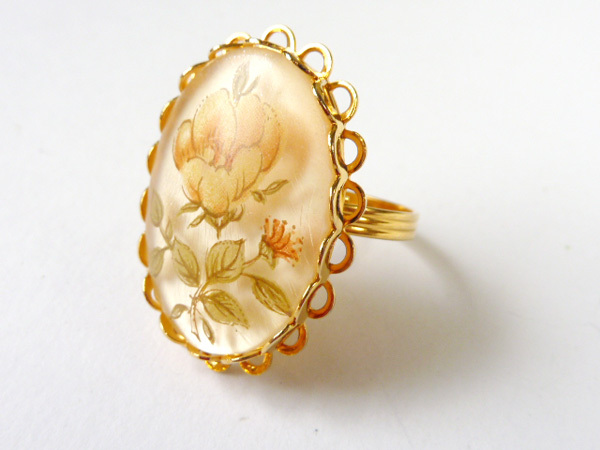 Please note the floral cabochons may have a speck of dust or two embedded, this is a common occurrence. 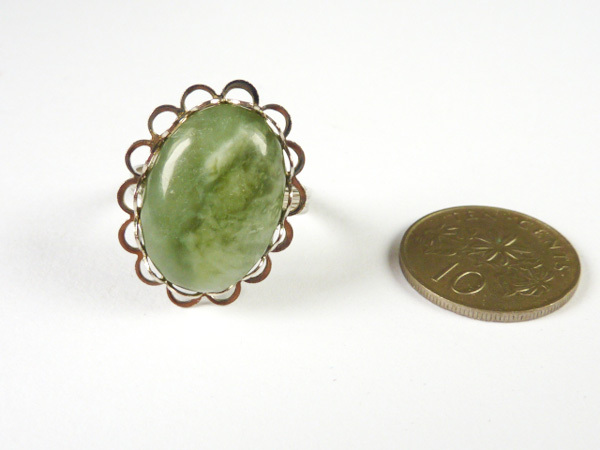 They are pretty old, possibly from the 1920s-1940s. The shank is silver-plated, sturdy and nice quality. It is adjustable but since the shank is thick it may be tricky to adjust smaller, The default ring size ranges from size 9 to 10.5. 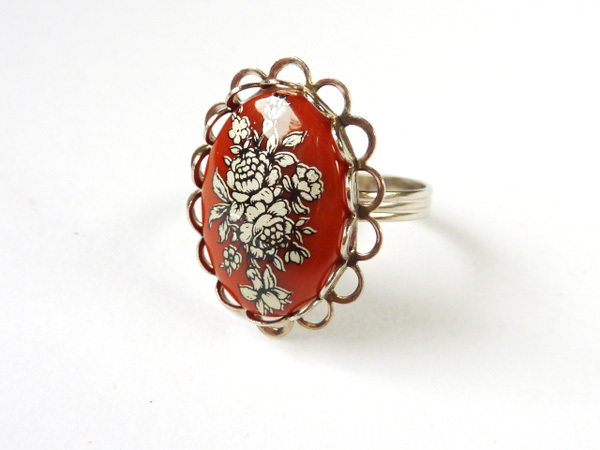 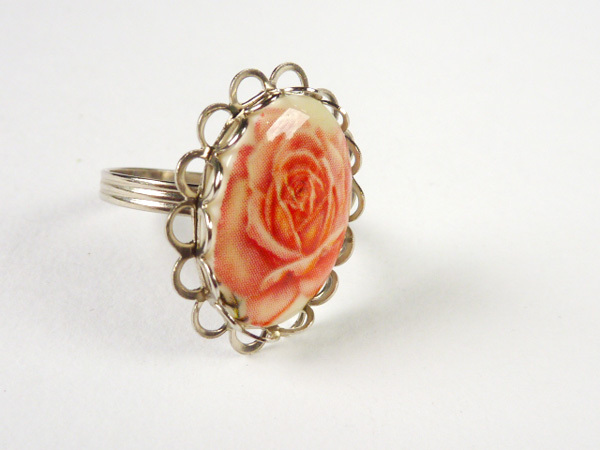 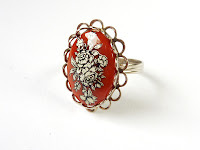 Vintage pretty West Germany cabochon featuring a floral design in silver, on carnelian-red acrylic base. Set on a vintage silvertone scalloped ring which is adjustable. 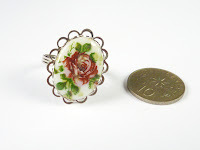 West Germany cabochon with multicoloured floral bouquet decal on an ivory-cream acrylic base, from the 1970s. 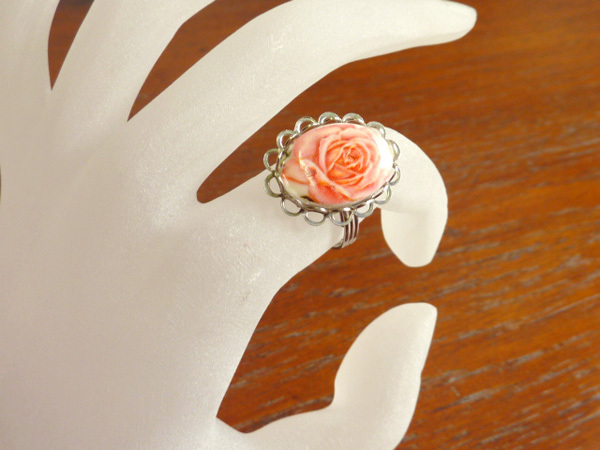 Set on a vintage silvertone scalloped ring which is adjustable. 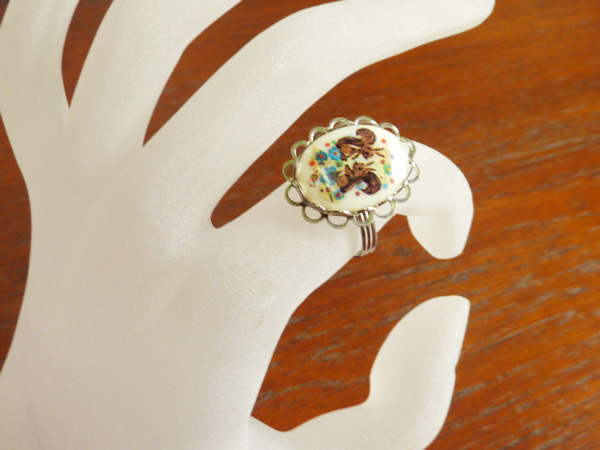 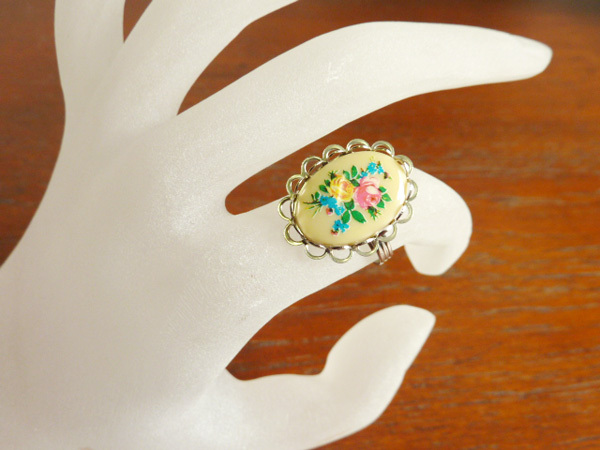 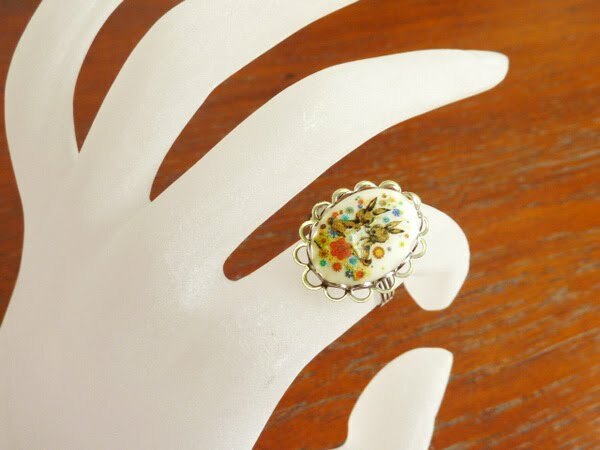 Vintage silver-plated scalloped ring with a vintage West Germany acrylic cabochon featuring a pair of cute bunnies among retro-looking florals. 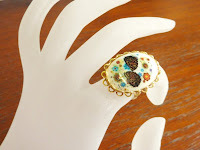 1960s cabochon. 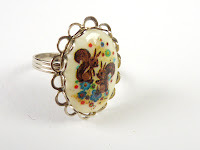 Vintage silver-plated scalloped ring with a vintage West Germany acrylic cabochon featuring a pair of cute squirrels among retro-looking florals. 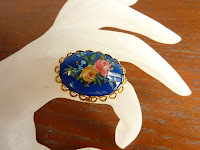 1960s cabochon. 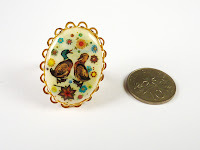 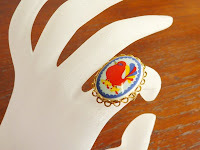 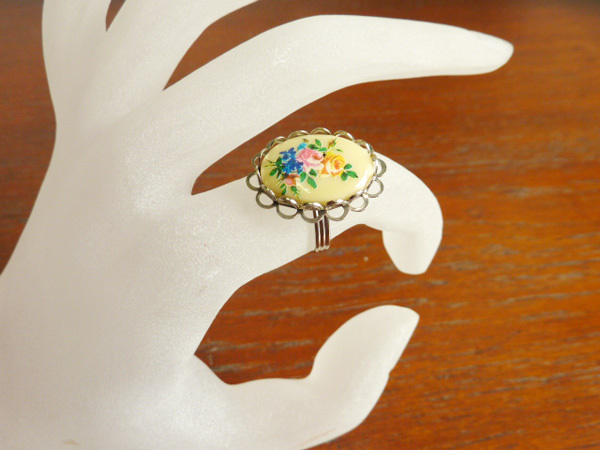 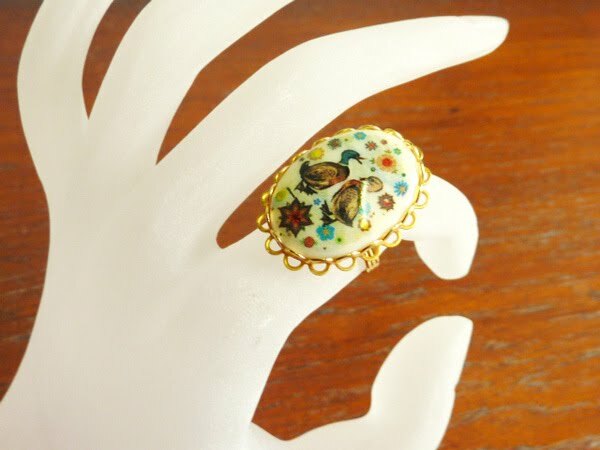 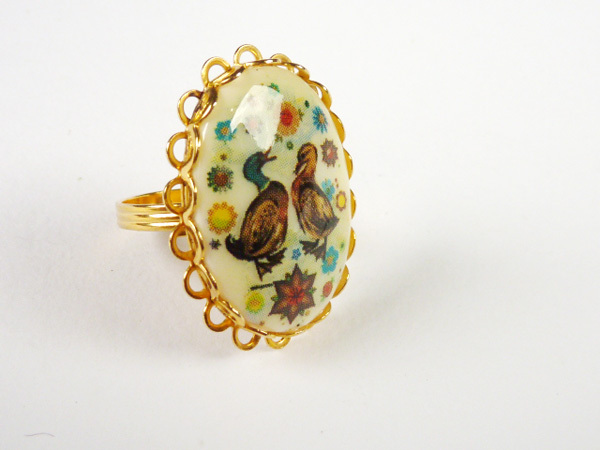 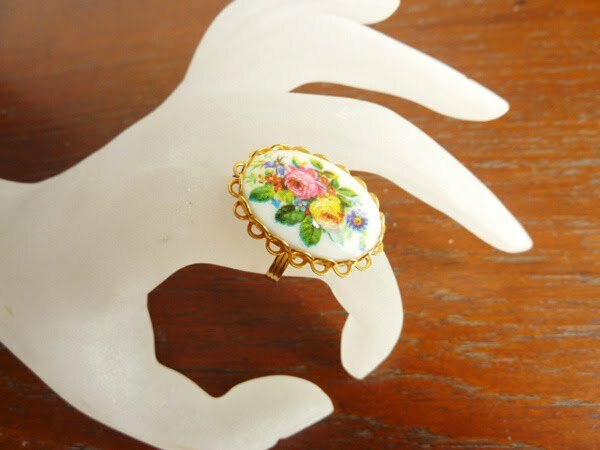 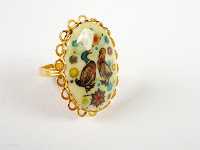 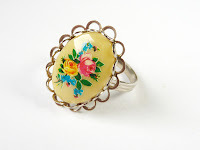 Vintage gold-plated scalloped ring with a vintage West Germany acrylic cabochon featuring a pair of cute Mallard ducks among retro-looking florals. 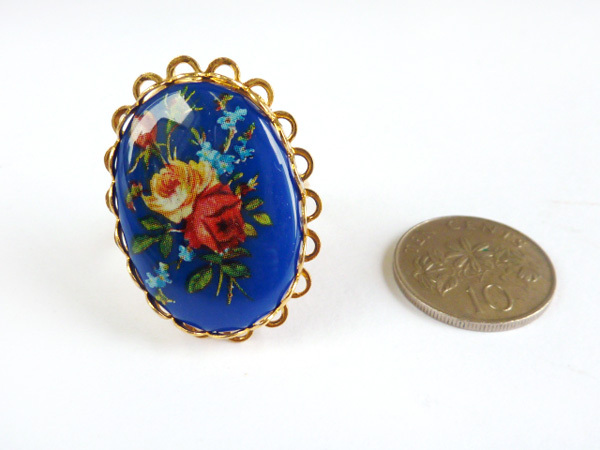 1960s cabochon. 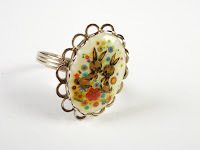 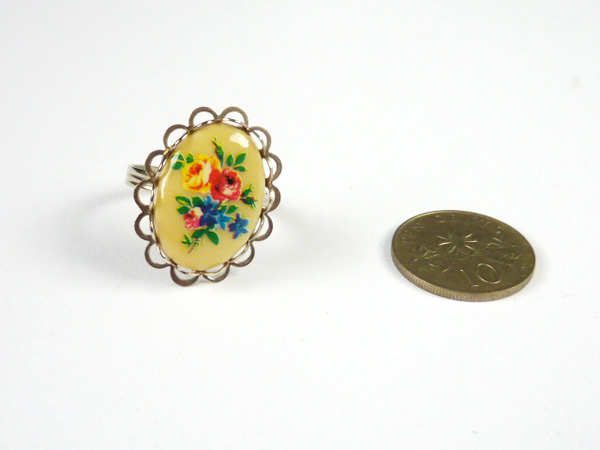 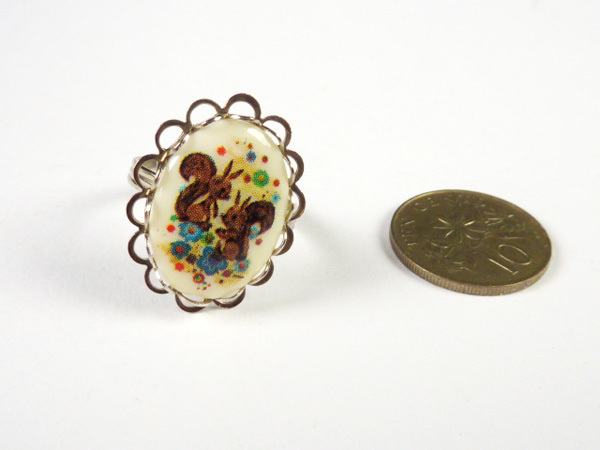 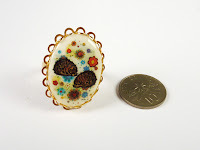 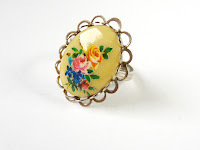 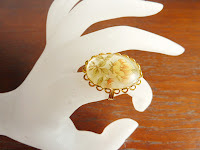 Vintage gold-plated scalloped ring with a vintage West Germany acrylic cabochon featuring a pair of cute hedgehogs among retro-looking florals. This one has a tiny bubble on the surface which is not obvious (can be felt but not really seen), I do not consider it a flaw. 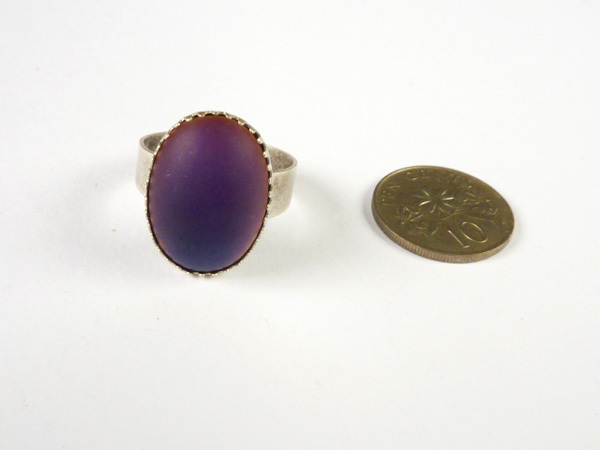 1960s cabochon. 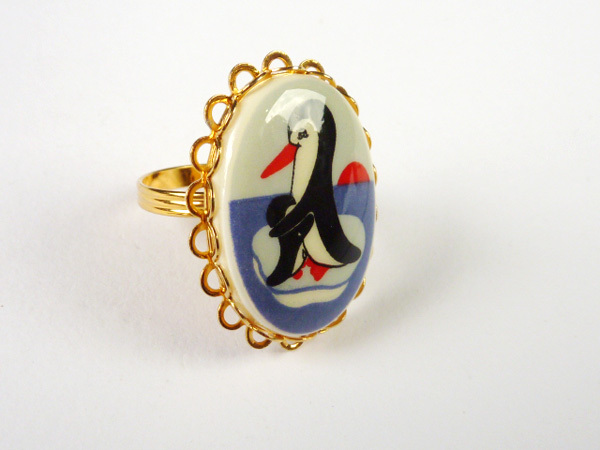 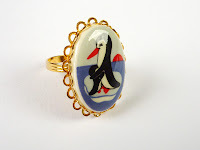 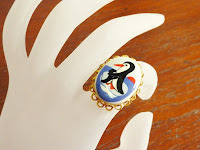 Vintage gold-plated scalloped ring with a vintage West Germany acrylic cabochon featuring a penguin mother and its baby. 1960s cabochon. Vintage gold-plated scalloped ring with a vintage West Germany acrylic cabochon featuring a sea tern/ seagull mother and its chicks. 1960s cabochon. 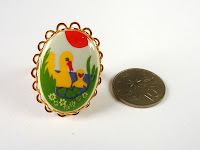 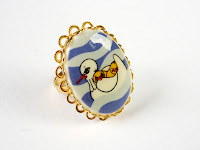 Vintage gold-plated scalloped ring with a vintage West Germany acrylic cabochon featuring a duck mother and its duckling in a pond. 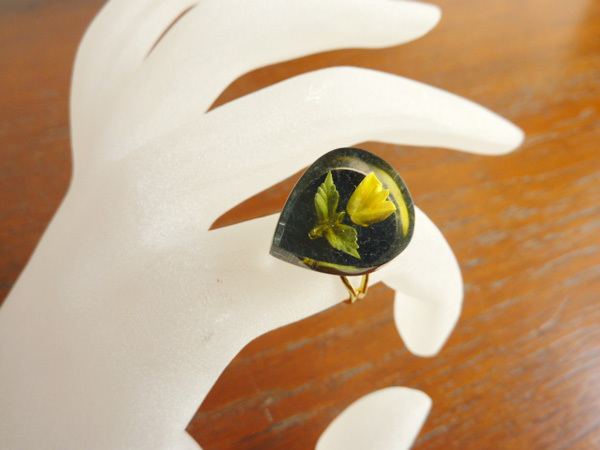 1960s cabochon. 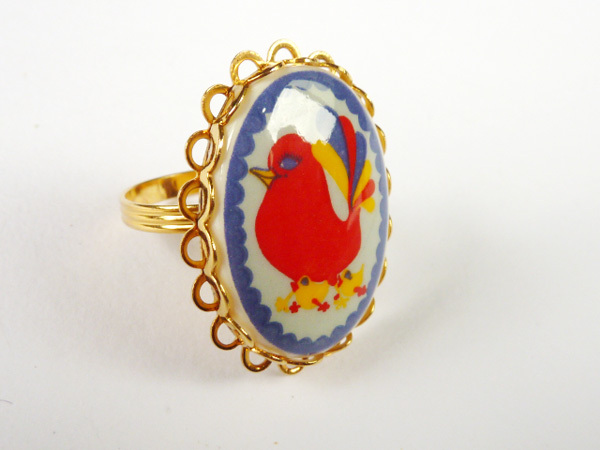 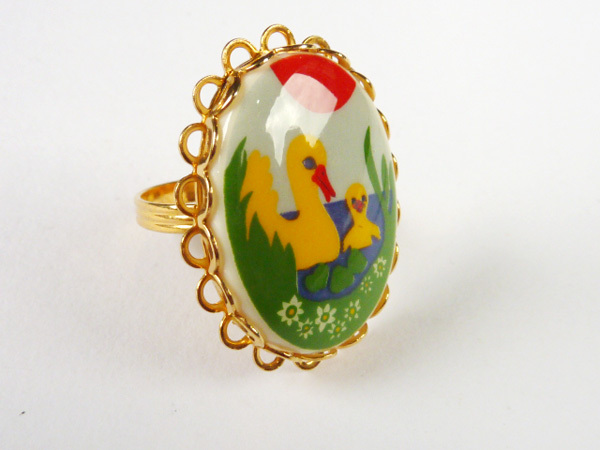 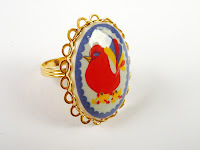 Vintage gold-plated scalloped ring with a vintage West Germany acrylic cabochon featuring a red mother hen and its chicks. 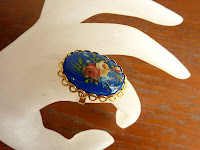 1960s cabochon. 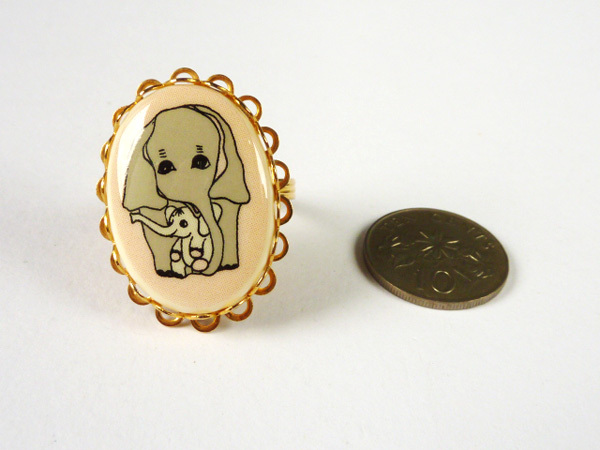 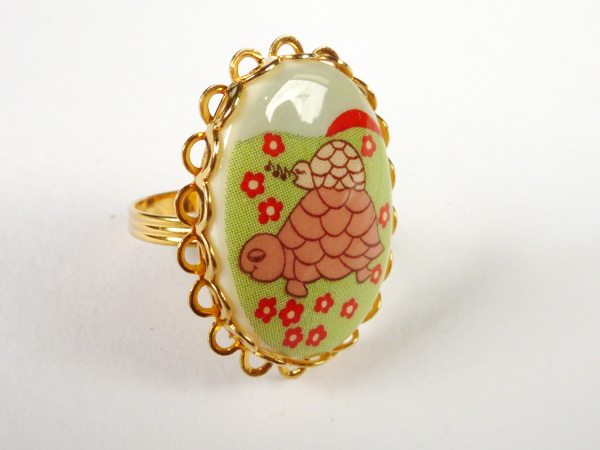 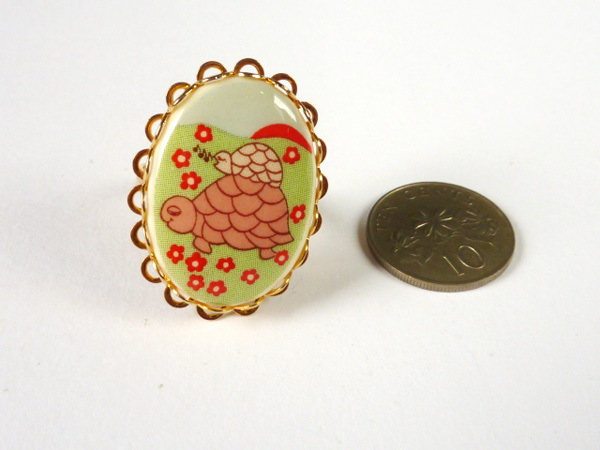 Vintage gold-plated scalloped ring with a vintage West Germany acrylic cabochon featuring a tortoise mother and its baby. 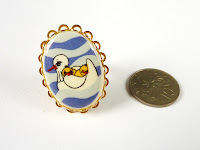 This is adorable the baby is perched on the mother's back and singing. 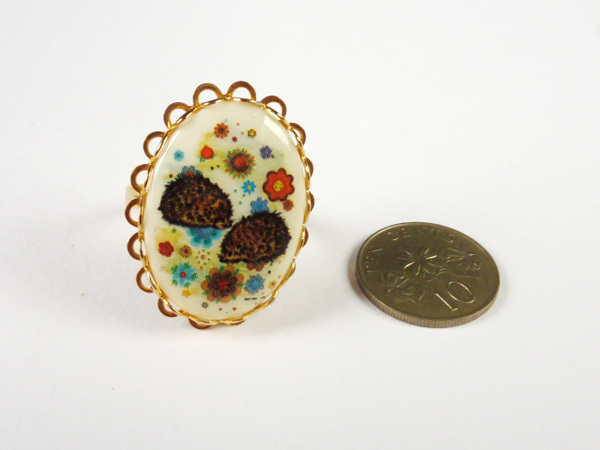 1960s cabochon. 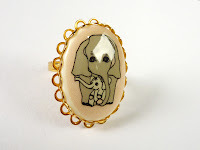 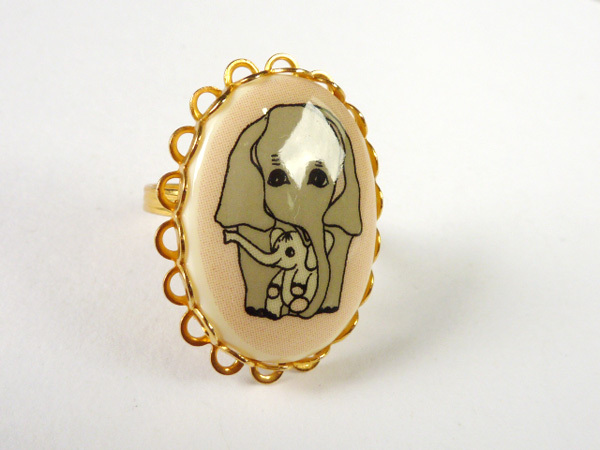 Vintage gold-plated scalloped ring with a vintage West Germany acrylic cabochon featuring an elephant mother and its baby. The background is a very pale pink. 1960s cabochon. 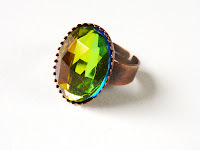 Rainbow hued faceted glass, beautiful colours, changes at angles. The shank is a new oxidised-copper plated over brass, lightweight and adjustable. 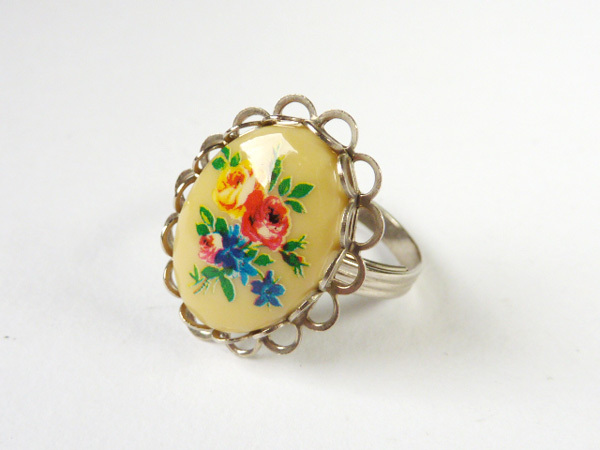 The glass colours may vary in different pieces, and may have slight minor scuffs from bumping around. 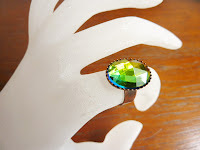 Rainbow hued faceted glass, beautiful colours, changes at angles. The shank is a new oxidised-silver plated over brass, lightweight and adjustable. 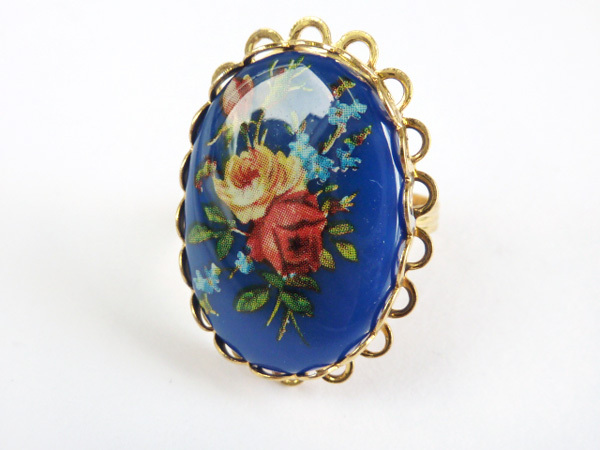 The glass colours may vary in different pieces, and may have slight minor scuffs from bumping around. Beautiful domed frosted glass with rainbow colours, changes at different viewing angles, the cabochon seem to glow with the playing of light. 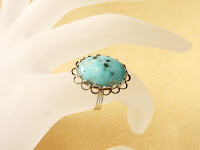 The shank is a n oxidised-copper plated over brass, lightweight and adjustable. The glass colours may vary in different pieces (more blue or purple when viewed from the top), and may have slight minor scuffs from bumping around. Beautiful domed frosted glass with rainbow colours, changes at different viewing angles, the cabochon seem to glow with the playing of light. The shank is a new oxidised-silver plated over brass, lightweight and adjustable. 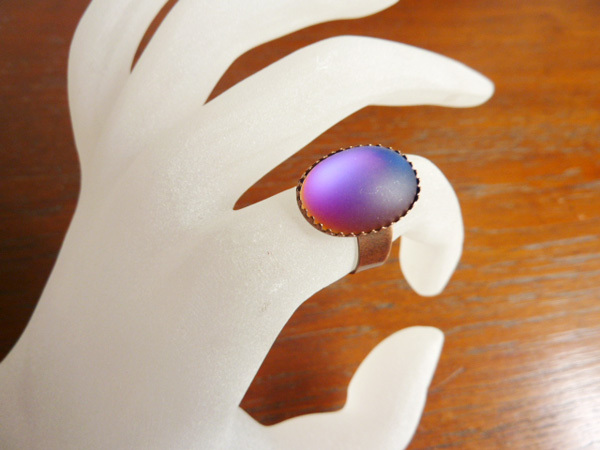 The glass colours may vary in different pieces (more blue or purple when viewed from the top), and may have slight minor scuffs from bumping around. 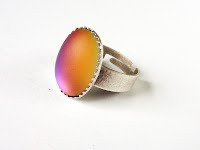 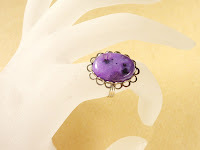 Vintage silver-plated scalloped ring with a vintage frosted ribbed glass in dark purple. 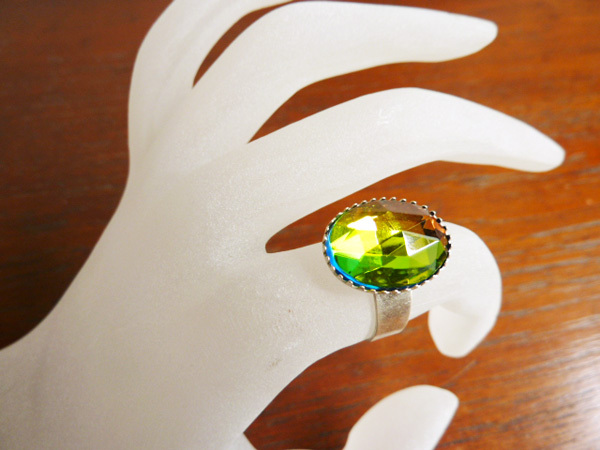 It has a diffused glow when light enters the glass. 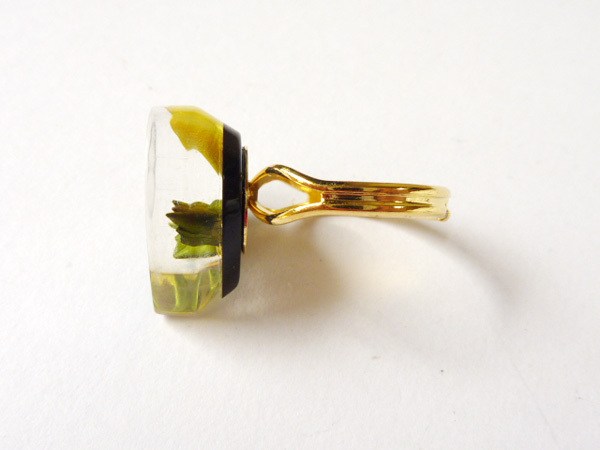 The glass may have minor scuffs on the surface from being bumped around. 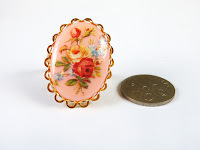 1940s/50s glass cabochon. 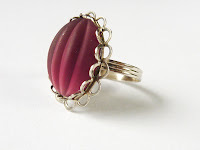 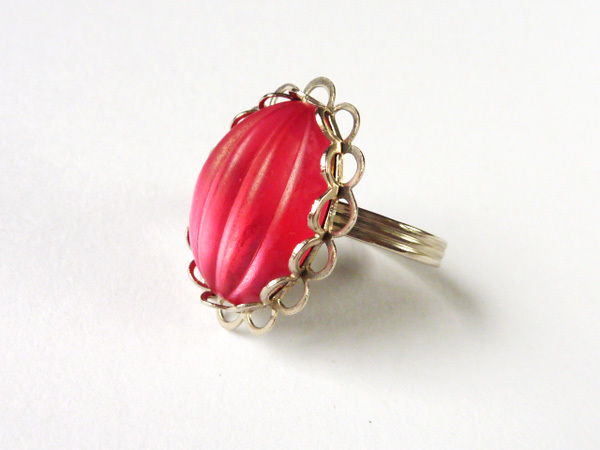 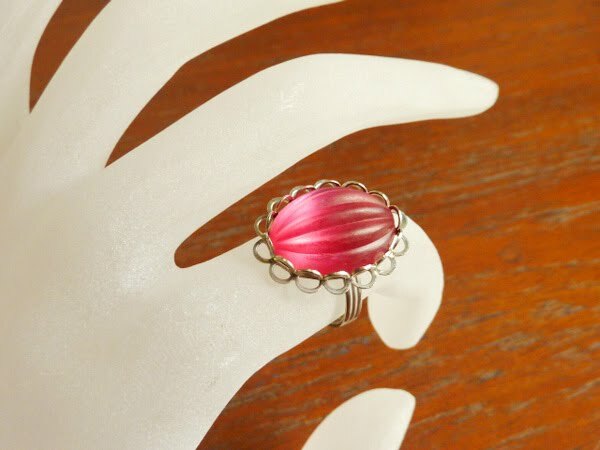 Vintage silver-plated scalloped ring with a vintage frosted ribbed glass in cherry red. It has a diffused glow when light enters the glass. 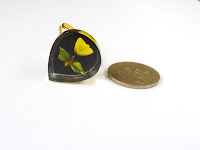 The glass may have minor scuffs on the surface from being bumped around. 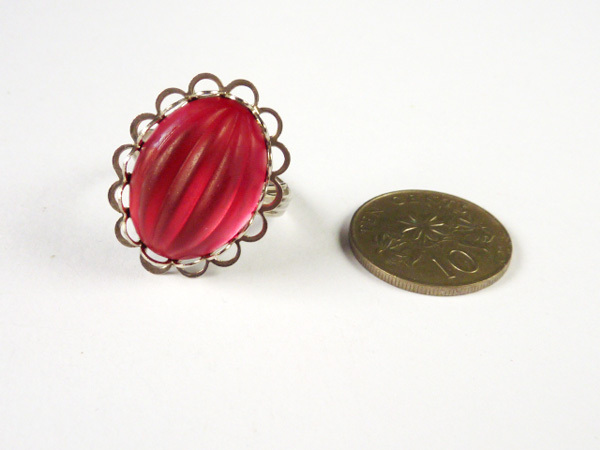 1940s/50s glass cabochon. 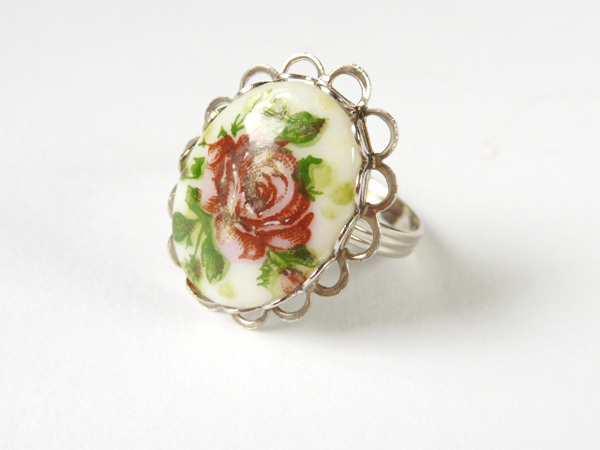 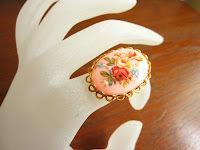 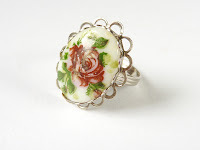 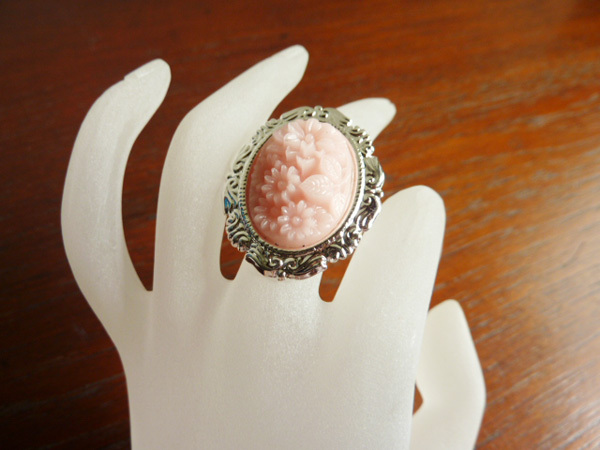 Vintage silver-plated scalloped ring with a vintage acrylic cabochon of a lovely decal pink rose. 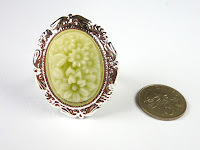 1960s- early 1970s cabochon. 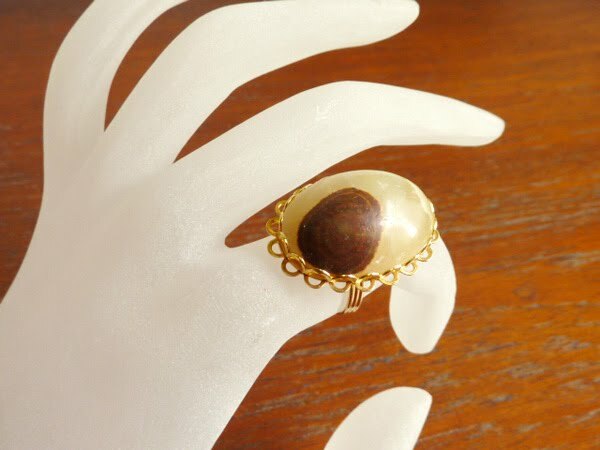 Vintage gold-plated scalloped ring with a vintage (probably) onyx stone that has a brown inclusion and bands. 1 piece only. 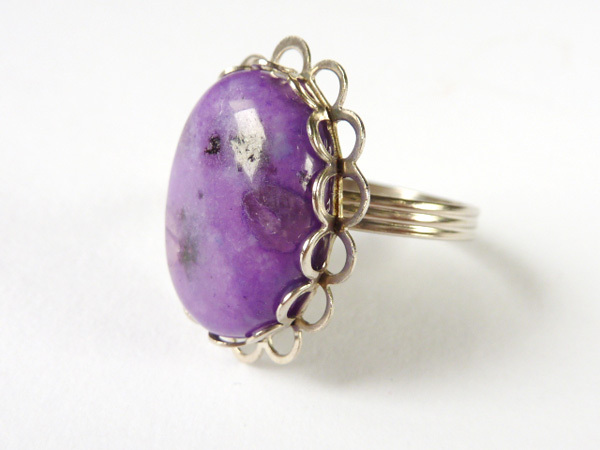 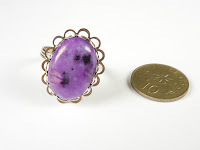 Vintage silvertone scalloped ring with a vintage purple stone cabochon (late 1960s-70s), which might be sugilite. 1 piece only. 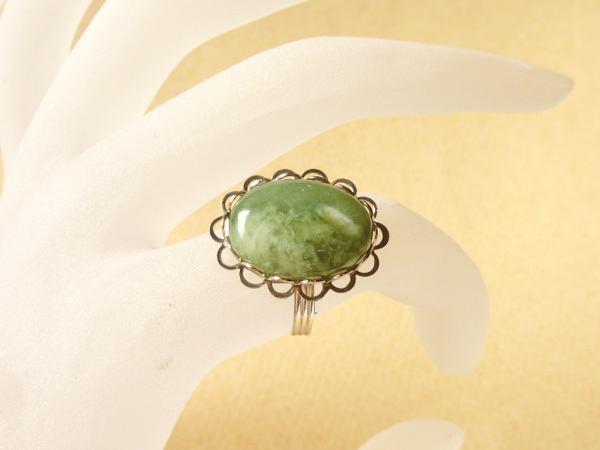 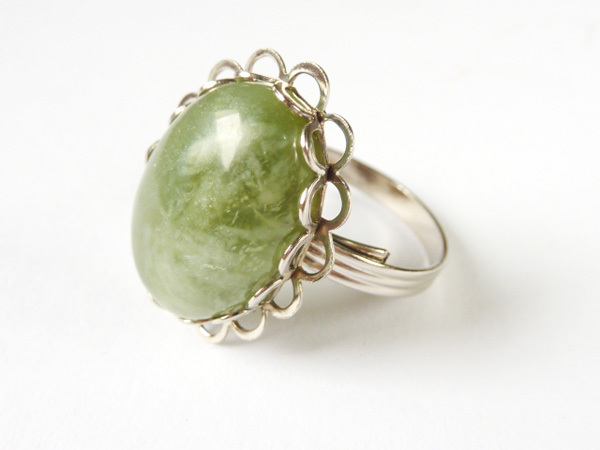 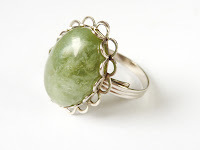 Vintage silvertone scalloped ring with a vintage green stone cabochon (late 1960s-70s), possibly prehnite or serpentine. 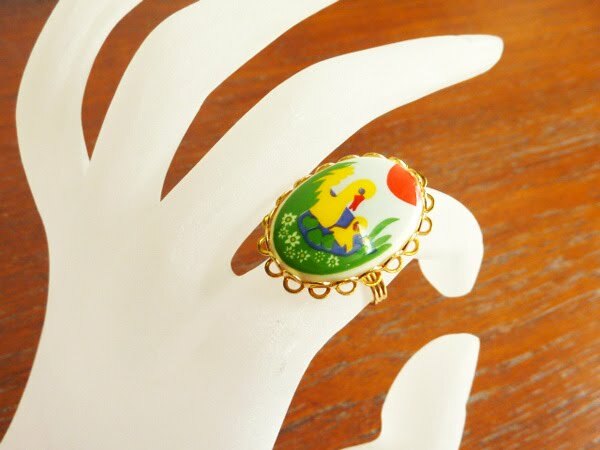 1 piece only. 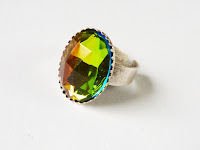 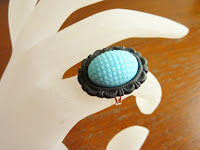 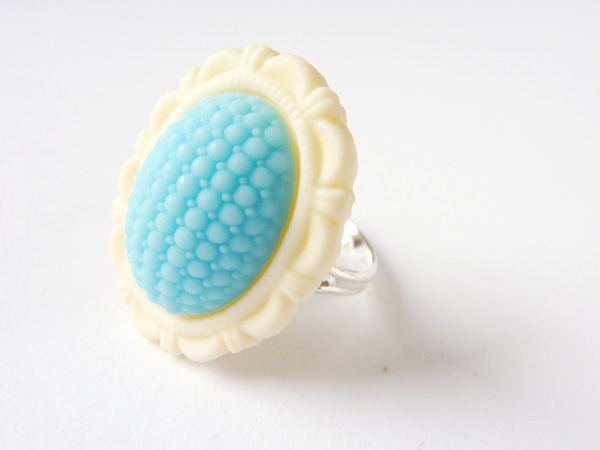 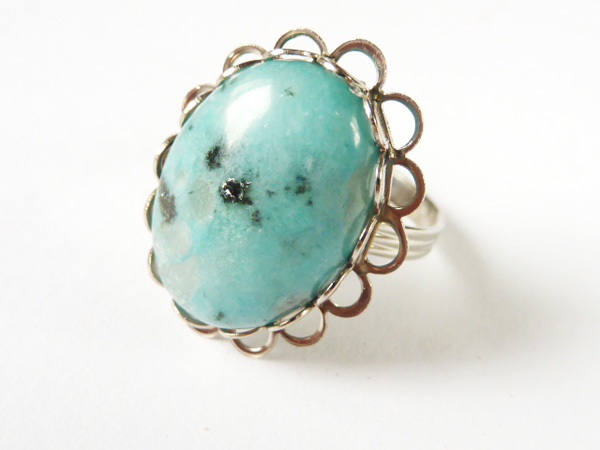 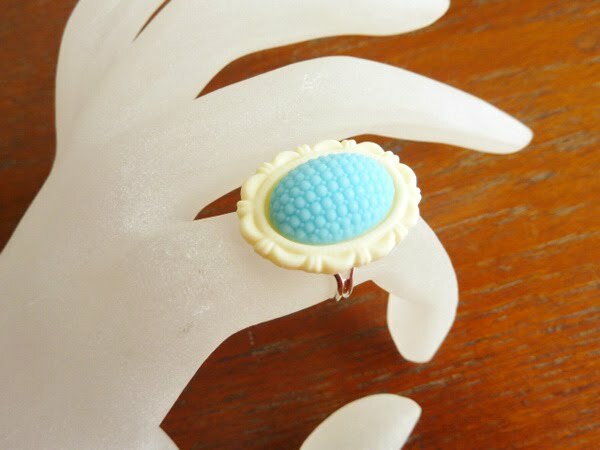 Vintage silvertone scalloped ring with a vintage aqua stone cabochon (late 1960s-70s). 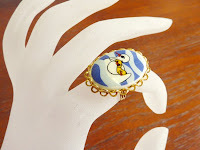 1 piece only. Vintage scalloped silvertone ring with a vintage West Germany glass/porcelain cab (late 1960s-70s) with a dark red rose decal. Very slight bubbling on the surface. 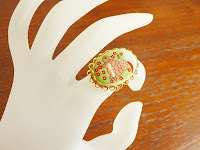 1 piece only.